Malt Mother of Vinegar, 8 oz. Home › Shop › Other Fermented Beverages › Malt Mother of Vinegar, 8 oz. Make your own malt vinegar! Make your own malt vinegar! This is an 8 oz. jar of malt mother of vinegar, a colony of acetobacter bacteria for making vinegar from your own beer! This 8 oz jar of mother culture can be used to make about 32 oz. (1 quart) of vinegar. Simply add the contents of the jar to 24 oz. of beer. Vinegar production usually takes about 6 to 12 weeks to be complete. After your culture goes to completion, you will have a not only vinegar, but a mother than can be reused on new batches of beer for more vinegar production! Please note that several factors can affect the speed and success of the mother culture working, such as temperature and air exposure.. Ideally the beer and mother mixture should have access to air and be at 80 to 85F. 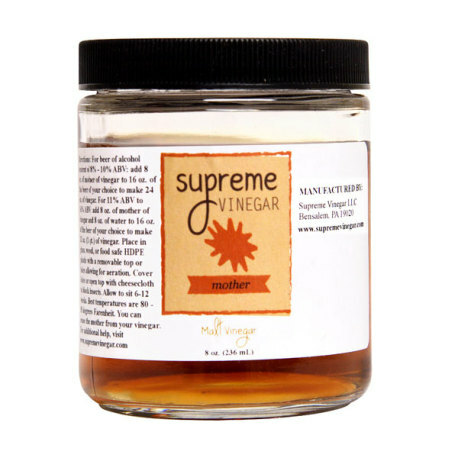 Make your own malt vinegar with this mother of vinegar culture!